The only remaining significant checks on the phytoplankton that cause algal blooms and dead zones are those menhaden schools, and they are now threatened by the ravages of unrestrained industrial fishing. By the end of the twentieth century, the population and range of Atlantic menhaden had virtually collapsed. The Menhaden is a small forage fish whose significance to our planet is remarkably disproportionate to its tiny size. Known as “the most important fish in the sea,” menhaden filter our waters and provide forage for many of the fish species that flourish along the Atlantic and Gulf coasts. But the most important fish in the sea is in danger of disappearing. The systematic slaughter of menhaden is the industrial fisheries’ best-kept secret. Hundreds of millions of pounds of Atlantic menhaden are removed annually from our waters by Omega Protein, a company that grinds them up to sell as fishmeal and pet food. 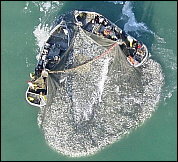 In 2010 alone, Omega Protein harvested 404 million pounds of menhaden. The population of Atlantic Menhaden has been reduced to a devastatingly low number — stocks have declined 88 percent in the last 25 years. Scientists are seeing troubling patterns emerge as a result of the loss, including severely malnourished species of saltwater fish that normally feed on them. Striped bass, tuna, cod, bluefish, swordfish, salmon, redfish, mahi mahi, king mackerel, and many other species depend on menhaden for food. Menhaden themselves are near the bottom of the food chain, feeding on plankton, and filtering harmful particles from our estuaries. They clean our waters at an incredible rate—some scientists have put the figure as high as four gallons a minute per adult fish! Each adult fish filters about four gallons of water a minute. Purging suspended particles that cause turbidity, this filter feeding clarifies the water, allowing sunlight to penetrate. This in turn encourages the growth of aquatic plants that release dissolved oxygen while also harboring a host of fish and shellfish. Even more important, the menhaden’s filter feeding prevents or limits devastating algal blooms. Most of the phytoplankton consumed by menhaden consists of algae. Excess nitrogen can make algae grow out of control, and that’s what happens when overwhelming quantities of nitrogen flood into our inshore waters from runoff fed by paved surfaces, roofs, detergent-laden wastewater, over-fertilized golf courses and suburban lawns, and industrial poultry and pig farms. 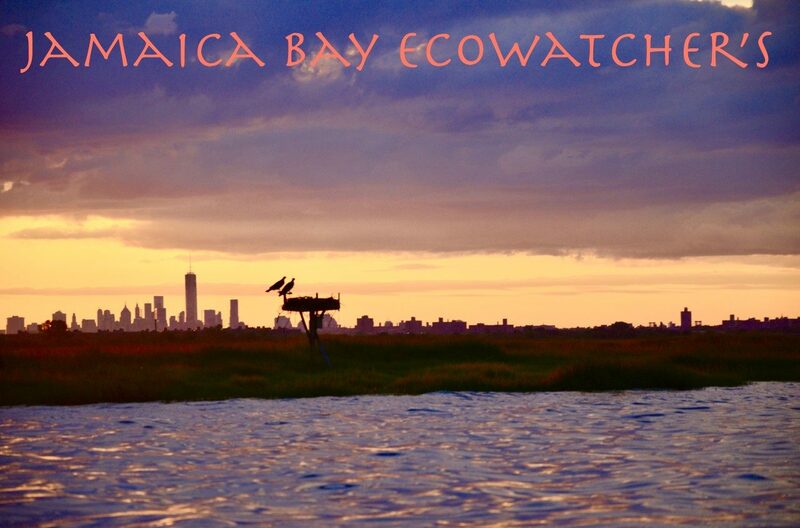 This leads to a concern on the part of those working to preserve and protect Jamaica Bay as the high nitrogen and subsequent algae blooms are cited for the dissolved oxygen and marsh loss problems the bay is struggling with. The Atlantic States Marine Fishing Commission ASMFC considers a number of issues as it debates its efforts to impose regulations (or not) regarding different species yet to date this has not been a factor in its discussions regarding Menhaden populations. It would seem that as many other areas ,such as the Chesapeake region are facing the same issues (high nitrogen loading and harmful algae blooms) it should be one of the criteria that ASMFC considers as it seeks to set quotas on the take of this highly critical species. Last week the Atlantic States Marine Fishing Commission -ASMFC-responded to overwhelming public comment the ASMFC finally decided to put the politics aside and agree to set catch limits in order to save this critical species. The comments in favor of such were over 91,000 compared to only 35 advocating that no action be taken. This is great news and will have tremendous positive implications for not only every level of the fish food chain but also for the waters of the many estuaries that have are experiencing algae problems as these fish consume the algae for food. You can read more hear and while this is great news we will have to watch to see that it is implemented and not turned back by the powerful corporate entities who have controlled the discussion on this issue for so long. This entry was posted in Jamaica Bay News on April 27, 2011 by Mundy.